A real-looking and nice-feeling kit. Excellent internet upgrades for RBM20 module. Standard head sound not convincing yet. More memory needed for RBM20 module. The E-Pro live is available in Jet Black and this swanky Quilted Maple Fade. It's a wrap, but it does look ace. The RBM20 module might not be new, but its update-ability with affordable third-party sounds adds real class. "Certainly the most 'real-looking' electronic offering from a big brand so far..."
"There remains something peculiarly enthralling about being sat behind a standard-sized set-up, with real sized drums. Which is pretty much what you get with the E-Pro"
You're one of the biggest drum brands in the world. You want to get in on the electronic drum market. So what do you do? Well, if you're Pearl, you design some clever heads to ﬁt on some existing wallet-friendly shells and team them with a 'made-over' sound module that can be upgraded with drum kits from the likes of Toontrack, BFD, Ocean Way and more. Even before it's out of its respective boxes, one aspect of the e-Pro Live's nature makes its presence felt. It's a heavyweight. The hardware box in particular asks a lot of the biceps, and gives the impression that what lurks within isn't likely to be spindly 'bedroom-only' metalwork. And indeed it isn't. Neither is the rack the kind of state-of-the-art ode to curviosity that some more established e-kit brands offer, especially with their ﬂagship models. "Shells are from Pearl's Export Series while the pads are confidence-inspiring in terms of build quality and feel, and look like standard heads too"
Instead the e-Pro relies on a no-nonsense arrangement of straight tubes that clamp together in solid fashion. Featherweight it might not be, but the rack is reassuringly sure on its feet and will lap up abuse. 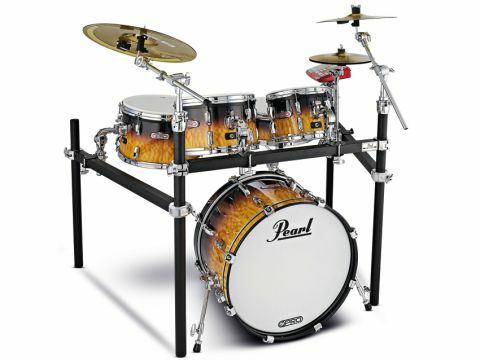 As will the rest of the hardware, culled from an extensive Pearl line-up that has proved itself on stages around the world for years. Cymbal and tom holders are familiar fare and give nothing to grumble about. Bringing the kit in on budget has meant sacriﬁcing the kind of 'virtual hi-hat' - those that mount on real hi-hat stands - that top-end kits get, however. Instead Pearl provides a lightweight hi-hat controller pedal that works with a pair of pads, albeit without any physical separating of the two when pedalled. As with all such arrangements, it takes some getting used to, given its lighter response than the real deal. But it holds its own with other similarly-styled offerings. The drums themselves are also fairly hefty. The shells are those from Pearl's former Export Series and, once ﬁtted with Pearl's Tru-Trac heads, they end up signiﬁcantly heavier than your average drums. But they're not unwieldy and the pads themselves are conﬁdence-inspiring in terms of build-quality and feel. Once installed, they look much like standard heads too, rather than space-age contraptions - which adds to the 'real instrument' feel nicely. At the core of the kit is the 'r.e.d.' (real electronic drums) box of course, and this does look rather more space-age, albeit in a kind of retro way. It also looks, hmm, remarkably close to Alesis' DM10 module in fancier clothes. In fact, bar the aesthetics, it's the same brain - a modest but decent performer that in its r.e.d. box guise can be installed with third party kits to give something of an upgraded aural experience. While ourselves and other electronic kit enthusiasts enjoy the view over a collection of pads and cymbal triggers, there remains something peculiarly enthralling about being sat behind a standard-sized set-up, with real-sized drums. Which is pretty much what you get with the e-Pro. Debate about the merits or otherwise of rubber, mesh and new technology heads, like Yamaha's Textured Cellular Silicon, continues to rage and are subject to personal preferences, of course. But we have to say that we found Pearl's solution to the question of acoustic-ish response from trigger pads very appealing. Nothing exactly emulates the feel of a normal head, but these are comfortable, with excellent rebound and less of the pronounced bounce that you get with some mesh types. It's very much a case of trying before you buy, but we liked them. We also prefer the bronze cymbals that Pearl has here to rubber cymbal pads. Again, they offer only an approximation of real cymbal feel, but the bite of wood on metal provides that extra degree of familiar response over other options. So the physical attributes of the e-Pro are largely on the money, but what of its beating heart, the RBM20 module? Well, it strikes a pretty decent balance between affordability and performance as standard, but harness the power of internet-deliverable upgrades and it can really shine. The module comes equipped with 100 preset kits - some really rather good, others that didn't really blow us away. But the best of the acoustic types are decently 'three dimensional' and reasonably dynamic. Machine-gunning rolls are noticeable here and there, but not pronounced - and pick the right presets and snare drums will deliver everything from ghost notes to rimshots quite convincingly. But things take a signiﬁcant step up when the RBM's processing power is put to use on optional third-party kits, downloadable from r.e.d.box Soundshop. We were given access to two Toontrack offerings - their Swedish Classic and Vibetastic kits - and although the difference between presets and 'installed' kits wasn't like black and white to colour TV, it wasn't far off the move from colour TV to high deﬁnition. The snare sound of the Vibetastic kit was immediately more biting and edgy and the toms fuller and more organic, providing an altogether more developed playing experience. If there's a downside, it's that installing one of these new kits takes all of the module's 128Mb memory so you can't have a choice of several installed. So the e-Pro is good out of the box, potentially really very good with your choice of aftermarket sounds - and is also usable as an acoustic kit with regular heads. We only very brieﬂy experimented with standard heads, and it's safe to say that Pearl's Reference customers probably won't have their ears swayed by the e-Pro, but it could prove a very useful option.